A few weeks ago, I found a nice looking guitar in a trash heap outside my neighbor's apartment. There was only one thing wrong with it: the headstock was broken off. Where others see tragedy, I see potential! A little clamping, glue, and magic putty later, and it was solid as a rock. And now it looks (almost) as good as new! For $2 worth of parts, and a little patience, I have a nice guitar to play for the last few months of my stay in Seoul. I'm very happy for myself, and for this gorgeous guitar; may it live long and sing many a tune! There are in fact three versions of the Boss CE-5, though the second and third ones are virtually identical, apart from having different colored labels on the bottom. All three are made in Taiwan, and all of the features are the same. The (BIG) difference between the first version (the Pink Label version) and the subsequent ones, is that the first issue of these pedals used analog circuitry, where the second and third issues used a fully digital, board-mounted circuit. Because of this major difference in design, these pedals sound radically different, despite looking exactly the same on the outside. The first edition of the CE-5 (the Pink Label version), made in the early 1990s, uses an analog BBD circuit to produce a delayed effect. BBD stands for "Bucket Brigade Device", and essentially works the same way. The signal is fed into a capacitor, and then emptied into another capacitor, along a line in the circuit. This effectively slows down the signal because of the time it takes to complete this process. When the signal comes out the other end of the BBD, it is combined with the original signal to produce the "chorus" effect after which the effect is named. This type of circuit is used in many popular analog chorus pedals, including the Ibanez CS9, the Boss CE-1 and CE-2, and the Electro-Harmonix Memory Man. I have always preferred analog effects to digital ones, and this distinction is why the first version of the CE-5 is so much more highly rated than the ones that followed. Upon testing the pedal, I found the effect to be very subtle compared to most Chorus effects I have used. In the past, I have used a Boss CE-2, an Ibanez CS10, and both the vintage and reissue Ibanez CS9s. While the CE-2 produces a richer, more noticeable effect, the CE-5 adds just a touch of chorus sweetness, and preserves the original signal better than any chorus pedal I've tried. There is also the added feature of the High and Low Cut/Pass control knob, which allows a little better control of the signal path. As with all the Boss pedals, the construction is very solid, and there are no issues whatsoever with reliability. I am not usually a huge fan of Boss pedals, but this one is a winner! This is my newest acquisition: A 2002 Burny Les Paul Custom copy. I bought this guitar at the Nagwon Musical Instruments Arcade in Seoul, Korea. It's 10 years old, and starting to show the signs of a nice aged guitar. The playing feel is fantastic - right up there with my 1989 Gibson LP Standard. The sound is quite extraordinary as well, thanks to a Fernandes Sustainer System. It literally sustains forever, and the tone is immaculate. I'm not usually a fan of gold hardware on a Les Paul, but the blue paint job really makes it look great. The tuners are smooth and hold tune quite well, and the tune-o-matic bridge is as accurate as the real thing. Since 2002 was the year that Fernandes moved production from Japan to Korea, and later China, there is some dispute as to where this guitar was made. The playing feel and overall construction quality suggest that it was made in Japan, but Korean-made guitars from the early 2000s are notoriously well built. Regardless, the current Chinese-made equivalent model retails for over $1000, so at 350,000 Korean Won ($309), I think it was a pretty good score. Rock on! After looking around at the selection, I determined that all of the used guitars were either out of my price range, or not exactly what I was looking for. That's when I saw this beauty hiding between two other guitars on a rack. The brand is "Ventures", a sort of house brand for the store. The guitars were made in China, but they are some of the best quality I have seen in a Chinese guitar. After viewing several incarnations of this model, I determined that there was very little consistency in the construction, set-up, and overall feel of the guitars. One had the wrong strings on it, one had a horribly bowed neck, and the three that I tried all had very different neck thicknesses and profiles. This one was almost perfect. It had a little fret-out on the 15th fret when bending, but the gentleman at the store fixed it for me. The body is solid maple, with a flamed top, and the neck (also maple) is nice and skinny, and also has a flamed figure to the wood. The frets are made from beefy stainless steel jumbo fret wire, and the inlays are even real mother-of-pearl! The electronics are all functional, though the single-coil pickups are MUCH weaker than the humbucker. The machine heads are vintage Kluson-style in-lines, and they hold tune well, and have very smooth action. Overall, I am very impressed with this axe. I spent the whole afternoon playing it, and it didn't let me down once. It has great tone, especially when driven a bit, and it feels and looks spectacular! The best part: the price. This guitar cost me 150,000 won ($132). Nowhere in North America could you find a guitar of this quality for even close to that price. So if you're in Seoul, or planning on traveling there in the future, be sure to check out Guitar Muse, and keep an eye out for one of these beauties! Since it appears that this guitar is still not considered garbage by local trash collectors, I have decided to document its slow decay and deterioration through a series of photographs. The chopsticks are gone, but someone has stuffed a twisted clothes hanger inside, and it looks like it's been stepped on. Stay tuned for more tragic updates on the worsening condition of this once-beautiful and still interesting guitar! A broken Sigma (Martin) guitar I found lying on the street outside my new apartment in Bangbae, Seocho-gu, Seoul, Korea. I guess these are more common here than they are back home in Canada. It's a real shame that this one is beyond repair; I've known a few of these guitars in my time, and they are gorgeous instruments. This is (was?) one of the earlier Korean-made Sigmas, which came into production in the 1980s, when Japanese manufacturing became too expensive to compete in the entry-level market. Made from high quality materials and built to the same specifications as their American cousins, these guitars are renowned for having a fantastic sound, and being able to take a beating (though, apparently, not this one). A couple years back, I saw a blog about someone making a pedal board out of an old briefcase, and I decided to make one for myself. I scored the case from the local thrift store for $3.99, and went to work! This is what I came up with. The board has a two-level bottom made from 3/8" plywood, with a slightly lower area on the right to accommodate a wah-wah pedal. All of the wiring connecting the pedals runs neatly underneath the bottom layer, and the entire rig runs on a one-spot power adapter. I have since painted the bottom black to give the whole thing a cleaner look; I will post pics as soon as I have them. Thanks for looking, and feel free to contact me for any advice if you're trying to make one for yourself! This is my latest guitar, a Peavey HP Special CT. This is one of the finest guitars I've ever played. Along with my Levinson Blade, this guitar is proof that you don't need a Fender, a Gibson, or a PRS to get the highest possible quality in an instrument. This particular guitar is the brainchild of Hartley Peavey, the owner and sole proprietor of the Peavey Musical Instrument Company, and the only guitar to bear his name and signature. The similarity to the EVH Peavey Wolfgang is no coincidence: while Eddie van Halen had an endorsement deal with Peavey - this guitar could be considered the evolution of the Wolfgang. The body shape is slightly different, but the same woods are used (birdseye maple for the neck, and an alder body with a thick flamed maple cap). The bridge is a solid, well-built Floyd Rose style tremolo that can be set (by means of a movable brass block inside the spring cavity) to down-only or floating. 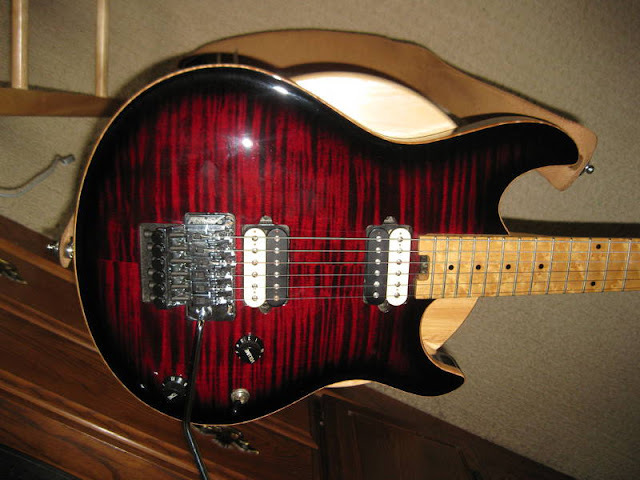 Although the guitar itself is pretty impressive in many respects, by far the best feature of this axe is the pickups, which are hand-wound humbuckers designed by Hartley Peavey himself. They are splittable as well, by means of push-pull volume and tone pots, although in my opinion they sound much better in humbucker mode. These pickups are extremely high output, and have a clarity I've never heard anywhere else. Unfortunately, they are ONLY available in this guitar (I'd love to take them out and put them in one of my other guitars, but then I'd have no pickups in this one!). The original retail price for these guitars was almost $3000, which is, I'll admit, a bit steep, especially for a guitar made by a company without a reputation for world-class instruments. And, although this is an exception, the price was too much for most, and very few of these made it to market. 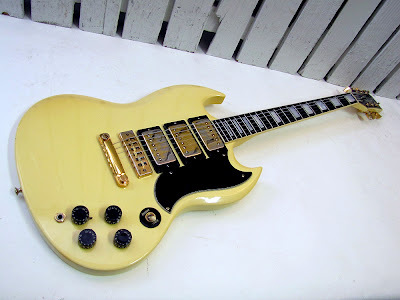 Nowadays, you can buy them used for around half that ($1500) on Ebay, in a shop that sells used guitars, or from someone who for whatever reason, actually bought one brand new. For this money, I'd say the HP Special is a great deal and can truly compete with anything in that price range. My only recommendation for someone looking into purchasing one of these is to try and find one of the later ones that were made without a tremolo system, unless you a) REALLY love whammy bars, and can't live without one, or b) are a professional guitar tech with a ton of experience setting up guitars with Floyd Rose style tremolos. Otherwise, you will have trouble getting the bridge to 'float' properly while still achieving perfect tuning. If you set the guitar to down-only mode, there is an unpleasant 'clunk' noise when the bridge hits the brass stopper, and because of the hotness of the pickups, this can come through your amp when you don't want it to. Overall, this is a great axe, and a very beautiful one at that. As I said to my wife earlier today, "this guitar doesn't make me miss my other guitars," and that's really saying something! It sounds as dirty as it looks - and as beautiful! I've been told for years that there is no contest between the original Boss DS-1 Distortion pedals made in Japan before 1988 and the ones made in Taiwan thereafter. Now I know for sure. I was fortunate enough to pick this one up at a pawn shop for $35, a very reasonable price, considering they run upwards of $180 on Ebay on a regular basis. Like most pedals from this era, it is not in the best shape cosmetically (dirty, paint-chipped, and a nice hole drilled through the back of the case), but it is fully functional, and sounds like a million bucks. Made in 1983, this is not the first issue of the DS-1, which had silver screws, a silver thumb-screw to open the battery compartment, and a longer dash in between the 'S' and the '1', putting the 'D' underneath the 't' in Distortion, instead of the 'i'. This one has black screws, a black label, and a black thumb-screw. However, this version of the pedal uses the same Toshiba TA7136AP op-amp as the earlier versions, and, besides the appearance, is identical to the silver screw version. So far, I've only had a chance to try this baby on a little 1-watt Fender Mini Deluxe, but I figure if it sounds good running through that (and it does, believe me! ), it should sound awesome when I plug it into a real amplifier. I can't wait!